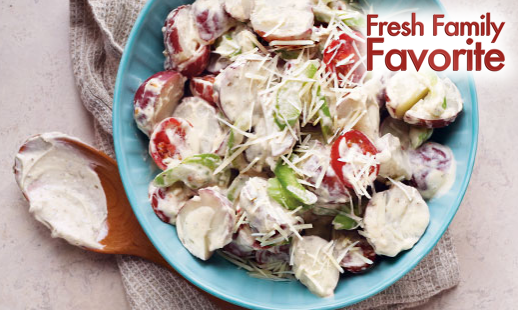 It’s summertime and with the season comes lots of picnic and party foods–the perfect time to make an easy potato salad recipe. Now, if you’ve been reading Faithful Provisions very long, then you know that for some time now I have been diligently moving my family over to a healthier eating style. I’ve always preferred cooking from scratch, but in addition to that, more and more now we’re choosing organic foods and opting for lots more heart healthy foods in our diet. As a busy mom, however, there are going to be times that I take a few shortcuts, and that’s okay. As a southern girl, there are going to be times when I need to indulge in comfort food, and that’s okay too. Philadelphia Cooking Creme Recipe of the Month for May is this easy Philadelphia Summer Potato Salad, and it satisfies those days when busy mom meets southern girl–deliciously! This will be a great side dish for taking to picnics, potlucks, Memorial Day and July 4th events this summer. Place potatoes in 2-qt. microwaveable dish. Add water; cover with lid. Microwave on HIGH 12 to 15 min. or just until potatoes are tender; drain. Place in large bowl. Add dressing; toss to coat. Refrigerate 1 hour or until completely cooled. Variation: Try it with PHILADELPHIA Savory Garlic Cooking Creme. Have you been using the new Philadelphia Cooking Cremes? Let me know your favorite flavors, and what dishes you’ve created! 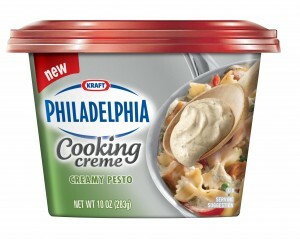 I was selected by Kraft Foods to participate in the Philadelphia Cooking Creme recipe program. While I have been compensated for my time, my opinions are my own, and I have not been paid to post positive comments. For more information about Faithful Provisions, please read my Disclosure Policy.